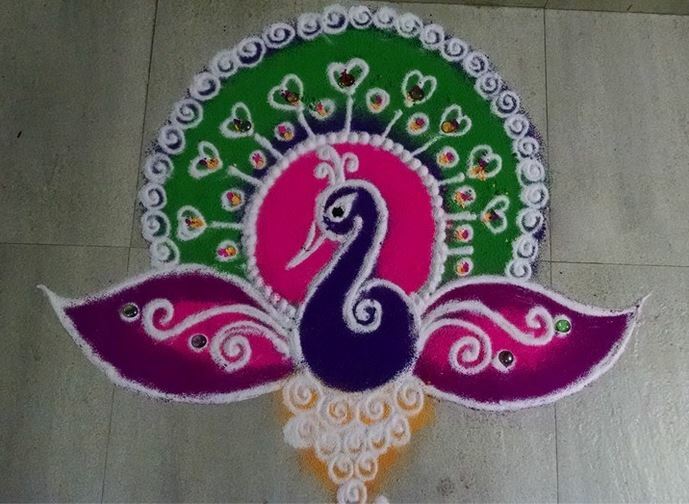 Making peacock rangoli designs for Diwali is the best way to decorate your home. Peacock is India’s national bird; the spread of its wings signifies joy, happiness and cheer. The mere sight of peacock brings a smile to everyone’s face. 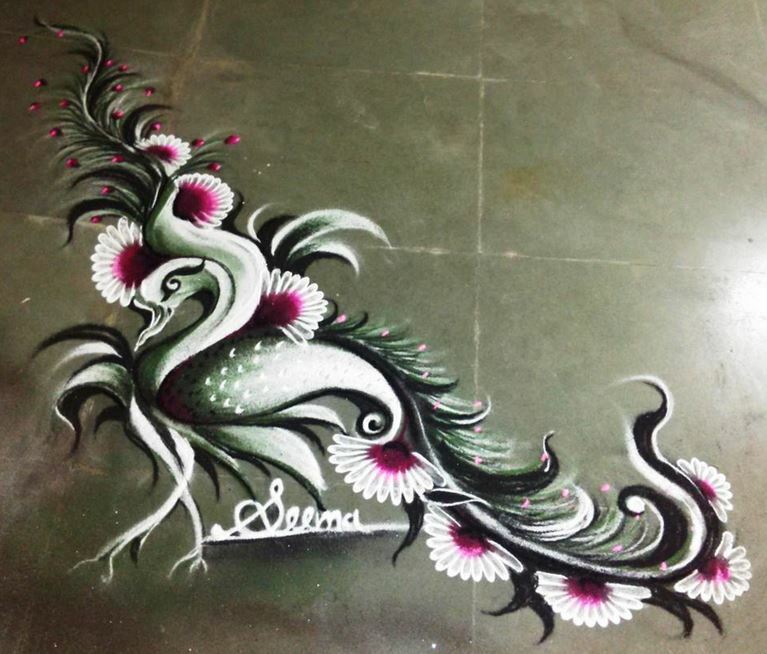 Here are some fascinating peacock rangoli designs for Diwali to inspire you. 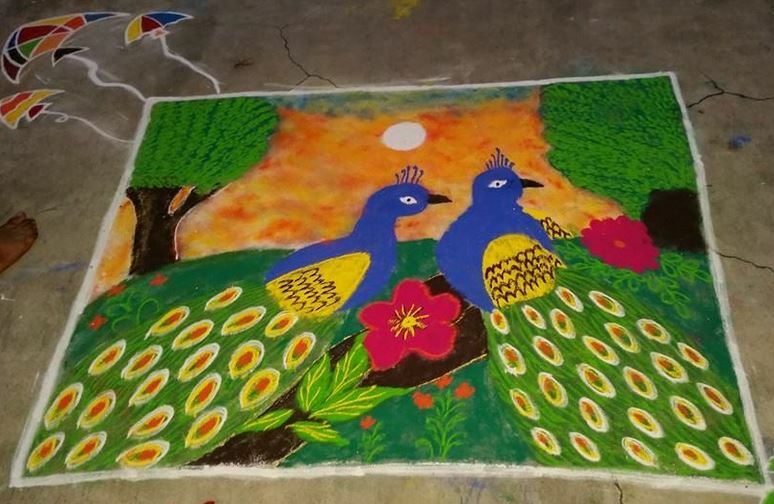 Create these pretty peacock rangoli designs during competitions and festivals. Take time and go through our latest peacock rangoli designs for Diwali collection. 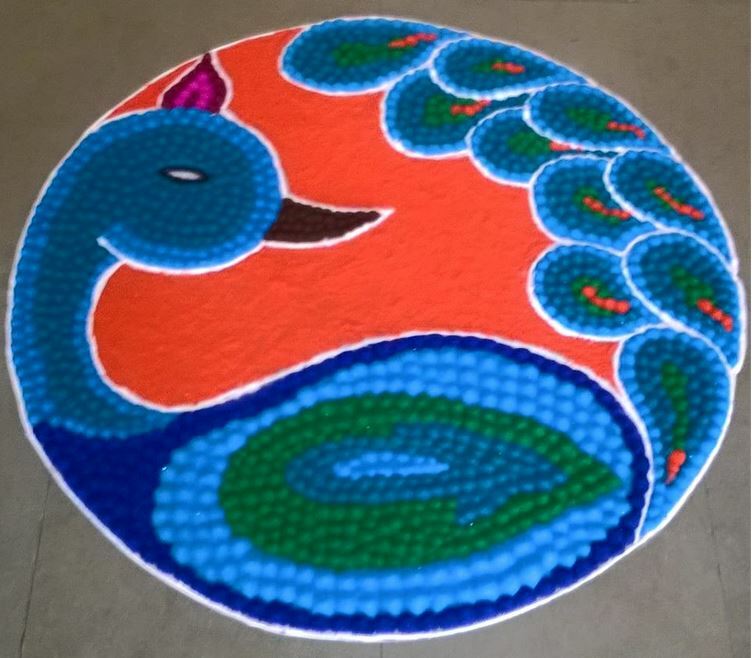 Make a round rangoli design and add two beautiful peacocks in the center. Use colorful rangoli powder to create this gorgeous peacock rangoli designs for Diwali. 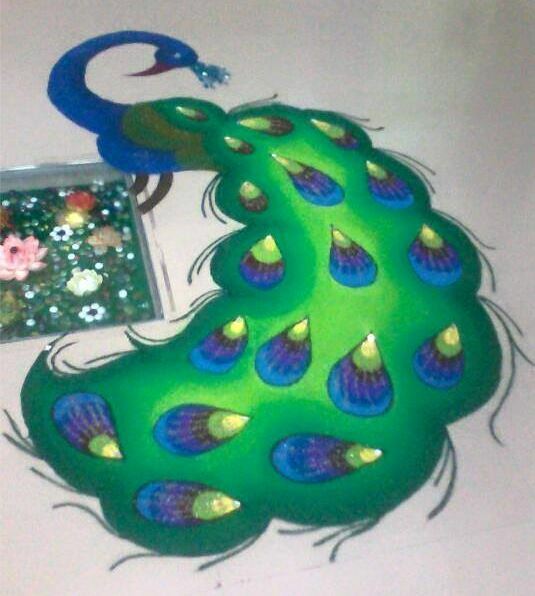 Decorate your home with this colorful peacock rangoli design. Use orange, blue and green color. Light candles or diyas around it. 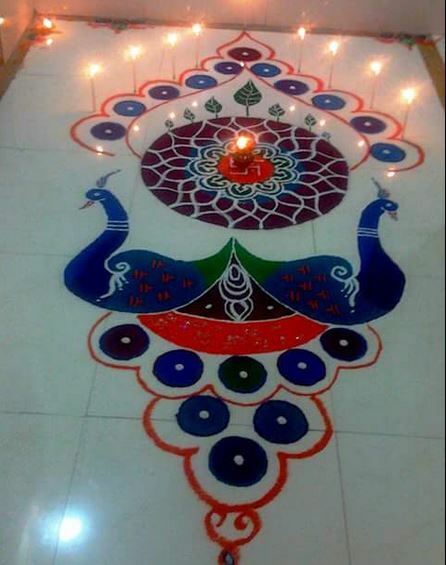 Here is an easy peacock rangoli design that you can make for Diwali. Make peacock feathers in this simple way. 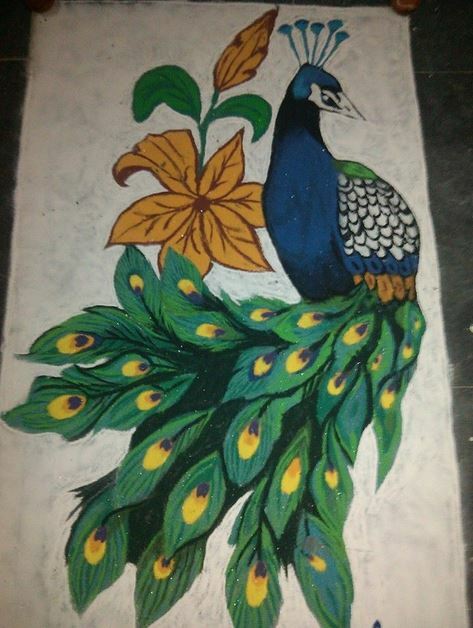 Peacock rangoli designs for Diwali can also be made during other festivals and competitions. Make this pretty bird any time anywhere. If you’re not an expert at rangoli making then, go for this simple peacock rangoli designs for Diwali. 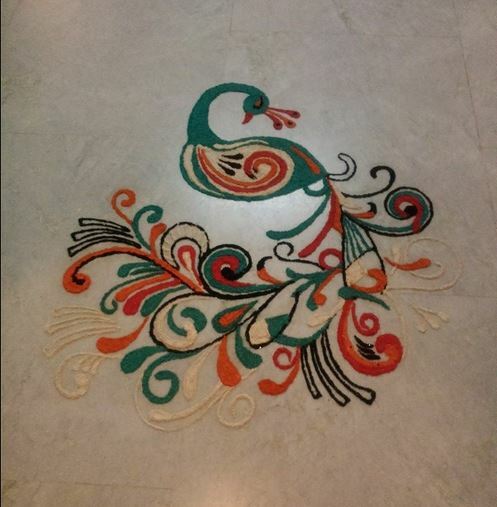 This is a very pretty peacock rangoli kolam. 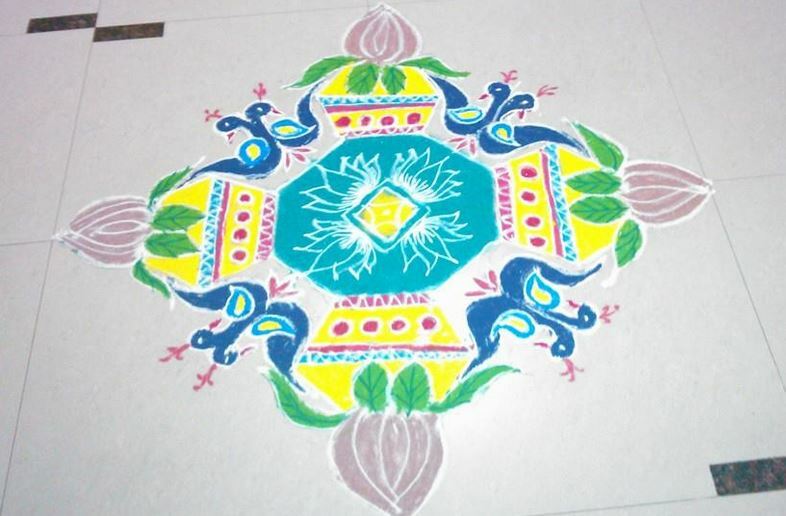 Try making this out-of-the-box kolam design for Ugadi, Holi, Sankranti, Ganpati or Diwali festival. 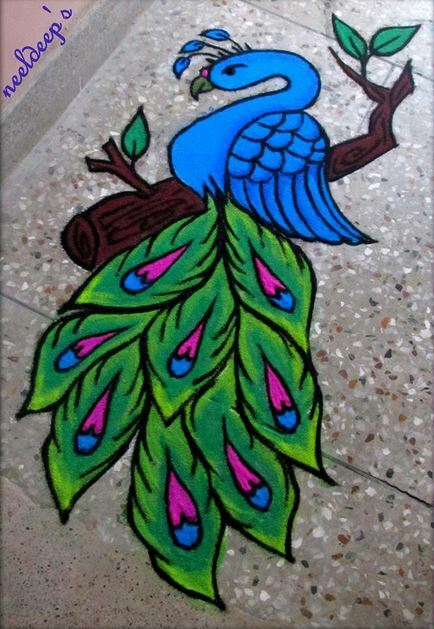 This is a peacock rangoli design for beginners and kids. It looks more like a painting than some rangoli design. Make a hexagonal center, add lotus flowers on it. Surround it with pooja kalash and peacock rangoli design. 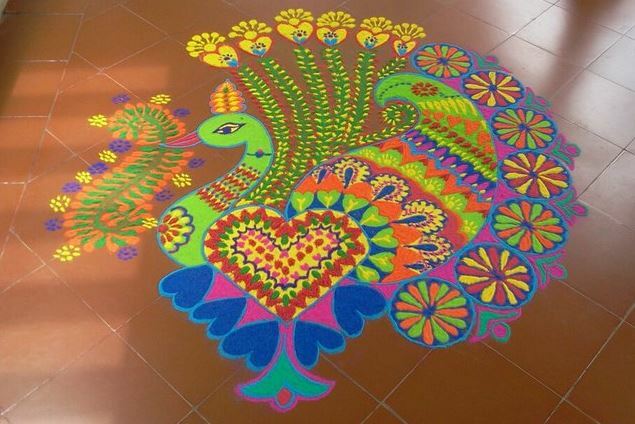 Here are some awesome peacock rangoli designs for Diwali. 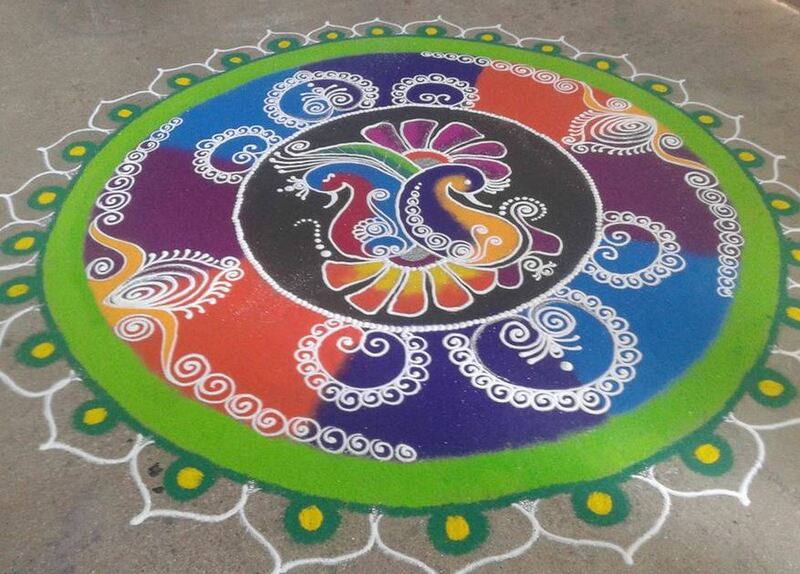 Make this stunning peacock kolam design during festivals. Get a bit creative; make a white and a blue peacock perched on Lotus flowers. 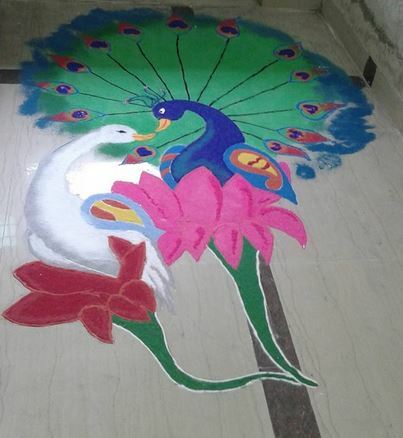 This rangoli design both India’s national bird ‘Peacock’ and India’s national flower ‘Lotus’. Make this majestic bird for rangoli competitions. These feathery creatures are one of the most beautiful creations of nature. Draw these small peacock rangoli patterns in your living room for Diwali. This design is very cute and easy to make. Make this kolam peacock rangoli designs for Diwali in your courtyard. Make sure you clean the ground and water it before making kolam design on it. 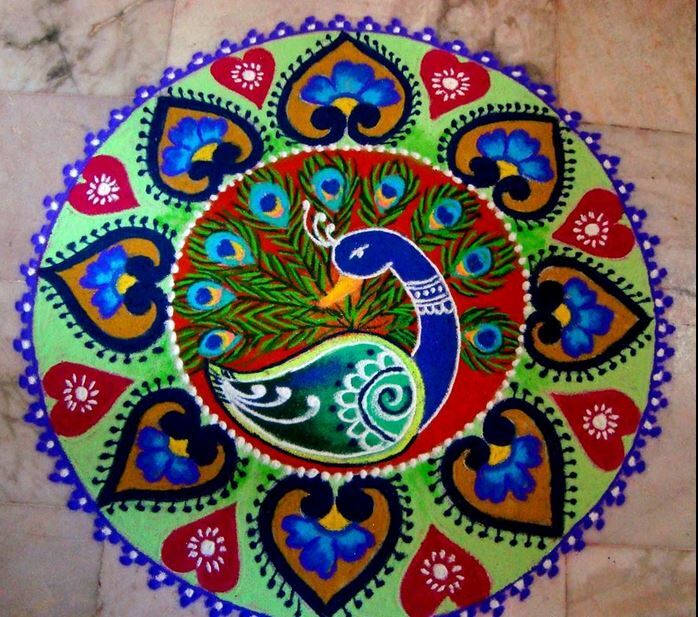 Use of vibrant colors makes this peacock rangoli design a show stopper. The design itself is very neat. Give it a clean look by marking the outline with black. This entry was posted in Rangoli Designs and tagged Beautiful and Easy Rangoli Designs, Beautiful Peacock Rangoli, Beautiful Peacock Rangoli Designs, Beautiful Rangoli Designs for Competition, Beautiful Rangoli Designs for Diwali, Beautiful Rangoli Designs for New Year, Beautiful Rangoli Designs of Peacocks, Best Rangoli Designs, Best Rangoli Designs for Diwali, Competition Rangoli Designs, Competition Rangoli Designs Diwali, Competition Rangoli Designs for Diwali, Diwali Peacock Rangoli Designs, Diwali Rangoli Designs, Easy Diwali Rangoli Designs, Easy Peacock Rangoli, Easy Peacock Rangoli Designs, Easy Rangoli Designs, Easy Rangoli Designs for Diwali, Free Hand Rangoli Designs, Fresh Peacock Rangoli Designs, Latest Peacock Rangoli, New Peacock Rangoli, Peacock Kolam Design, Peacock Rangoli, Peacock Rangoli Designs, Peacock Rangoli Designs for Beginners, Peacock Rangoli Designs for Competition, Peacock Rangoli Designs for Diwali, Peacock Rangoli Designs for Diwali Free Hand, Peacock Rangoli Designs for Diwali Freehand, Peacock Rangoli Designs for New year, Peacock Rangoli for Competition, Peacock Rangoli for Competition in College, Peacock Rangoli for Competition in School, Peacock Rangoli for Diwali, Peacock Rangoli for Holi, Peacock Rangoli for New Year, Peacock Rangoli for Ugadi, Peacock Rangoli Ideas, Peacock Rangoli Images, Peacock Rangoli Patterns, Rangoli Designs, Rangoli Designs for Diwali, Rangoli Designs for Diwali Indian, Rangoli Designs for diwali photos, Simple Peacock Rangoli, Simple Peacock Rangoli Designs Diwali, Simple Peacock Rangoli Designs for Diwali, Simple Rangoli Designs by Homemakeover. Bookmark the permalink. Very nice, attractive and interesting designs.